We’d love your help. 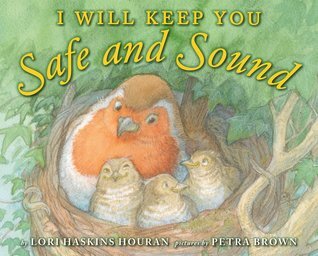 Let us know what’s wrong with this preview of I Will Keep You Safe and Sound by Lori Haskins Houran. Parents reassure young ones they are safe from harm in this loving, lilting lullaby. While the first buds peep. I will keep you safe and sound." Through storms, snow, wind, and waves, every child will feel safe and sound in the warm embrace of a loving parent. To ask other readers questions about I Will Keep You Safe and Sound, please sign up. With soft illustrations and gentle rhymes with a reassuring refrain, this should be a good bedtime book. Animal parents communicate their love for their offspring on each spread of this gentle rhyming book. The illustrations of the animal pairs are adorable. This is just perfect for bedtime reading with toddlers. My grandchildren, ages 3 and under, love this reassuring picture book. The text, just two lines per double page spread, rhymes with the next page's text. Every third page includes the refrain "I will keep you safe and sound" which rhymes with the two lines of text on that page. The refrain is italicized which serves as a cue, when pointed to, for your little one to "read" the phrase. Animals pictured include a mother bear and her cub, a mother hare and two kits, a robin and three nestlings, an a My grandchildren, ages 3 and under, love this reassuring picture book. The text, just two lines per double page spread, rhymes with the next page's text. Every third page includes the refrain "I will keep you safe and sound" which rhymes with the two lines of text on that page. The refrain is italicized which serves as a cue, when pointed to, for your little one to "read" the phrase. Mothers are certainly a cozy, sweet shelter! Cute and who can resist lost kittens? Not me! I liked this book. It could be easily adapted into a song. It had a nice predictable nature. I would read it in the Spring to show how animals take care of their babies. I would talk about how parents take care of their families and ask them for some ways that their parents take care of them. Animal Babies and P I liked this book. It could be easily adapted into a song. It had a nice predictable nature. I would read it in the Spring to show how animals take care of their babies. I would talk about how parents take care of their families and ask them for some ways that their parents take care of them. Such a sweet book to read with young children. My son particularly loved the last few pages where you thought, for just a second, that the adorable striped kitten didn't have anyone to keep him "safe and sound". Then the touching illustration of the mama cat finding him and returning him to the family snuggle time just melts your heart, especially if you are a cat lover. Glimpses of animal babies and their parents are given with the animals in their natural habitats. The narrative is essentially a poem with watercolor illustrations. The last animal is a lost kitten who is found and brought back to its family. This book is all about the message that parents are to take care of their children and protect them. This is sweet, but additional. Little ones will enjoy reading about how their loved ones always keep them safe and sound, even if they might get lost. Soft watercolor illustrations detail how all Mommies keep their little ones safe and the expressions on each of the animals help to paint a peaceful feel to the book. A gentle, reassuring book about baby animals being lovingly protected in a variety of environments will be a lyrical way to compare animal homes for the preschool set. Soft watercolor illustrations accompany the rhyming text, always returning to the promise to keep the young one safe and sound. A lovely reminder to your little one that each one is safe and sound inside the arms of loving parents. Beautiful illustrations and soft lyrical text help make this book a treasured part of bed time and nap times. If you are looking for tender, this one's it. A nice, quiet reassuring book for toddlers and early PK. Pair with "Mama Always Comes Home" by Wilson. Gentle story for parents and children, would make a great story for bedtime. Sweet and comforting. Great for a calming bedtime. A lovely illustrated story of mothers and their babies in safe, cozy homes as rough weather or predatory animals lurk outside. The illustrations are quite whimsical, but sturdy and warm.